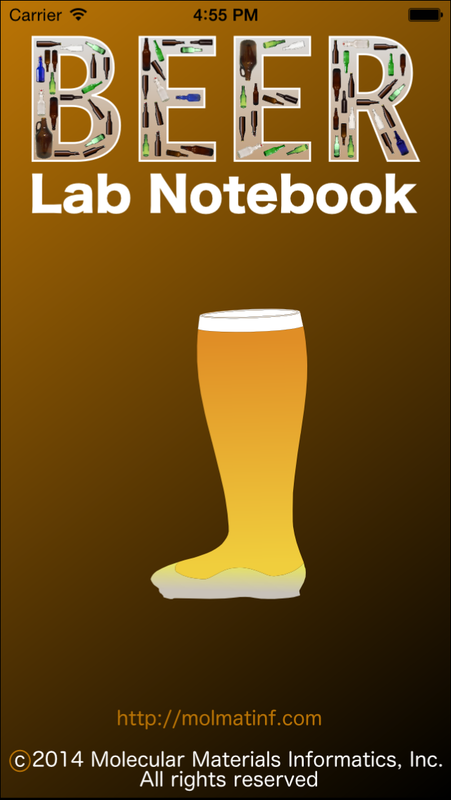 Today another of my apps just got through onto the store: the Beer Lab Notebook, which can be found on the iTunes AppStore. The name of this app is inspired by the title of my last new app (the Green Lab Notebook): its subject material is more or less serious, depending on your priorities. 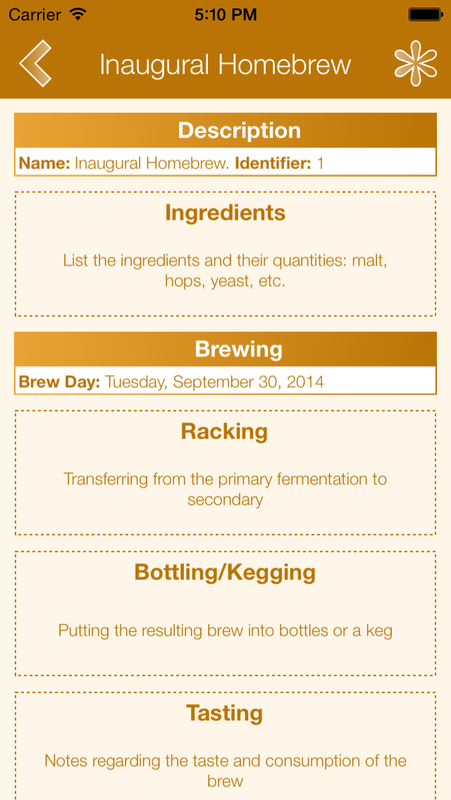 The app is designed to help record the process of creating a fermented beverage, as practiced by millions of homebrewers, myself included. The official reason for taking time out of my busy cheminformatics development roadmap to indulge in a hobby project is the introduction of Apple’s new Swift programming language. To make a long story short, I decided to learn it in an environment where I couldn’t damage my existing codebase, and so rather than taking on a learning project that is completely discardable, I decided to create something I would actually like to use myself. Like an unsurprisingly large number of former laboratory chemists & biologists who moved on to desk jobs, I derive great satisfaction from applying my hard won skills to the preparation of mild intoxicants of the malty carbonated variety, not to mention sharing the results with friends. Up until now, all of my homebrew records have been scribbled out in a couple of paper exercise books. After the first dozen or so batches, a lesson that I learned over the next few dozen is that the degrees of freedom don’t vary all that much when it comes to writing things down. At the amateur level that I am entirely comfortable with, highly detailed nuances are not incredibly important: just a list of the ingredients, how long they spent in the pot, the temperature readings, gravity measurements, how many days each step took, what the final product tasted like, and notes about anything unusual that happened along the way. One of the maxims of beer brewing is thus: making good beer is easy; making the same beer twice in a row is hard. That’s a constraint that works for me: if every brew I make is great but different to every other one, I have no complaints. Still, every once in awhile I hit upon something particularly delicious, and have the desire to make something that is at least similar, and for that I need to keep records. 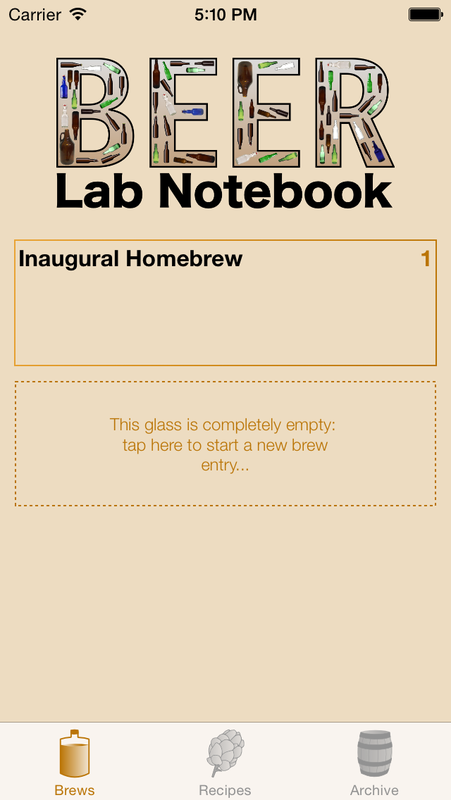 The Beer Lab Notebook app is a tool that aspires to simplicity, which is the advice given by all of the gurus of the consumer internet mobile industry these days. While this is unrealistic for most of my products, which are based on an inherently non-simple subject matter (i.e. science), for recording a beer brewing experiment, this is actually a bit more attainable. 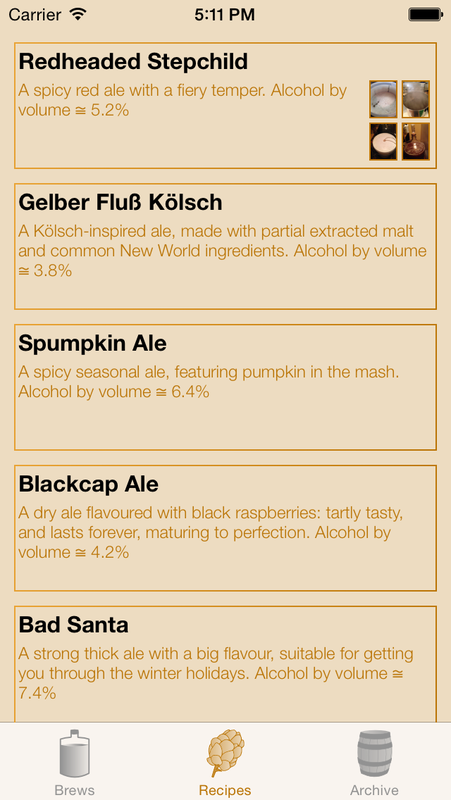 The latest example, which is a beer that I brewed very recently and used the app to field-test, is colourfully named the Redheaded Stepchild. It’s a red ale with chili peppers. As an aside, besides the fact that I personally enjoy strong flavours, basically any kind of fruit or herb is loaded full of antibacterials, acidity or bittering agents that serve to slow down the action of bacteria (otherwise multicellular organisms would have all been digested by prokaryotes). This is actually a double whammy positive benefit: stronger flavours mask the side effects of sloppy brewing, but they also reduce the degree of unpleasant flavours resulting from contamination, since the bacteria cannot operate as effectively, whereas the slow-but-steady yeast cells are much less bothered. So if you want to always have good beer outcomes, stick to India Pale Ales, and anything with a lot of potent adjuncts. One of the tedious parts of brewing, normally, is whipping out the calculator to work out how much alcohol is implied by the gravity readings, and so of course this is calculated automatically by the app. And one of the features that paper & pen are currently unable to provide is the ability to capture and embed photographs (unless you like gluing in polaroids…). Since integration of productivity software & camera is one of the strongest value propositions of mobile devices, this is naturally incorporated into the Beer Lab Notebook. I’m certainly not adverse to having some pictorial records of my zymurgy adventures. 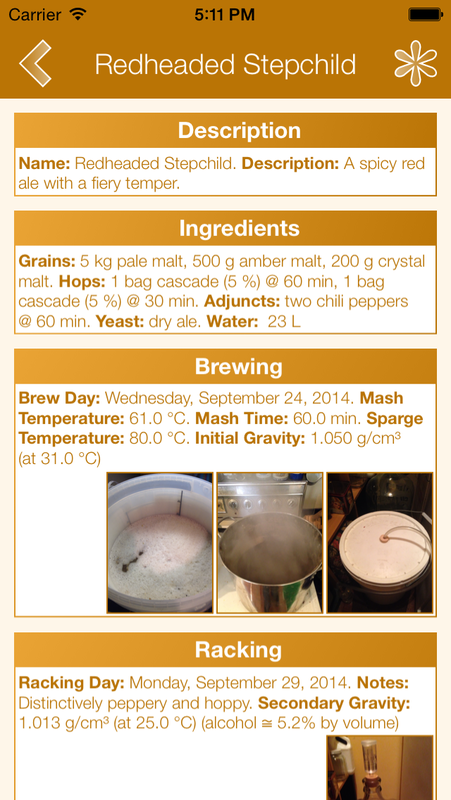 This first release of the app is a fairly basic product, and it is designed to provide the functionality that I, personally, need for recording my beermaking. Other brewers will no doubt want to record a few other things that I don’t consider important, and I’m quite happy to consider adding new features. At the moment, the exporting options for the brews are limited: you can pass the data around, but a “version 1.1” kind of feature will be to format it up as a PDF file, or some other sort of document format, which makes for nicer record keeping with more general purpose software.